E-commerce giant Alibaba Group Holding Ltd. is making another big bet on brick-and-mortar, saying it will pay $2.88 billion for a 36% stake in China's second-largest big-box retailer, Sun Art Retail Group Ltd. Alibaba, which runs the world's largest online shopping operation, sees traditional retail venues as a way to expand its reach into fresh foods while also creating new demand for its Alipay mobile-payment business and its logistics services. 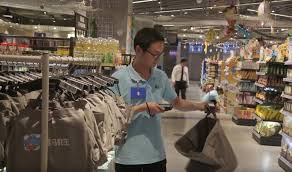 "Physical stores serve an indispensable role during the consumer journey, and should be enhanced through data-driven technology and personalized services in the digital economy," Alibaba chief executive officer Daniel Zhang said in a statement. Alibaba's wager follows online retailer Amazon.com Inc.'s $13.7 billion purchase of U.S. grocer Whole Foods. While Amazon is competing head-on with supermarkets, Alibaba says it is focused instead on joining with retailers. Its rush into physical retail in recent years already involved investments of at least $5 billion, as it took stakes in companies including shopping-mall operator Intime Retail Group (Co.), Sanjiang Shopping Club Co. and electronics retailer Suning Commerce Group Ltd. Alibaba also runs the small Hema supermarket chain in China, which offers internet purchases and deliveries within the hour for customers within its vicinity. Hong Kong-listed Sun Art is a French-Taiwanese joint venture that runs more than 450 large supermarket-department stores in China under the RT Mart and Auchan brands. Alibaba is buying both a direct stake and indirect stake. As part of the transaction, Auchan Retail, Sun Art's main shareholder, its raising its stake to 36.2%. Sun Art gained popularity for customizing its store products and formats to local needs, such as stocking hot sauce on shelves alongside live clams in tanks for shoppers to pick and choose. Sun Art's 14.6% share of China's hypermarket sector last year made it second only to China Resources Holding Co., at 15.5%, according to industry researcher Euromonitor International. Wal-Mart's China operation is third with 10.2%. Annual sales growth at Sun Art has been slowing in the past three years, as more Chinese move their grocery shopping online. Revenue grew 4.1% in 2016, compared with 5.0% a year earlier. One banker involved in the transaction expects more such tie-ups of physical and online retailers, based on conversations his team is having with other clients in Asia Pacific. China International Capital Corp. advised Alibaba on the deal, while Citigroup Inc. advised the Taiwan-based seller.